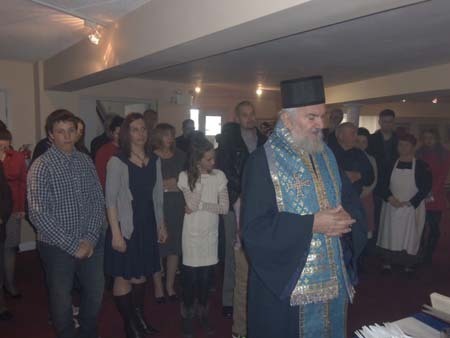 Milton, Ontario - The great feast of the Annunciation, which is also the Slava of the Monastery Kolo Sestara, was festively celebrated with the Holy Hierarchical Divne Liturgy at the Holy Transfiguration Monastery in Milton, Ontario. Bishop Georgije of Canada served the Divine Liturgy, with the concelebration of the Sindjel Fr. Vasilije (Gavrilovic) and Deacon Stefan Ikonomovsky. Following the liturgy the Slava banquet was prepared at the monastic dwelling. The Serbian poet Djordje Sladoje, who happens to be in Canada presently as a guest of the Serbian-Canadian Philanthropic organization "Jovan Ducic", enhanced the Slava celebration. Kuma for the Slava was sister Olja Djukanovic from Kitchener, together with her family. The honor of being next year's kuma was accepted by the president of the monastery Kolo Sestara Evica Cavic.